Hundreds of friends and supporters of Pannal Ash Junior FC savoured the family atmosphere at this year’s Almsford Community Fun Day. Last year’s fun day was a hit, and the overwhelming verdict from those attending on Sunday seemed to be that this year’s event was even better - with crowds filling the playing fields to celebrate the football club’s 40th anniversary, and their nearly completed club pavilion. 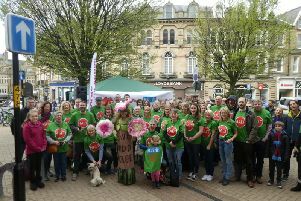 Dozens of stalls and family activities were organised for the day, and live music from groups including the All Together Now choir, The Nightjars, and the Harrogate Youth Wind Orchestra also wowed the crowds. The fun day was officially opened by Harrogate and Knaresborough MP Andrew Jones. The money raised from the event will go towards fitting out the football club’s new pavilion.